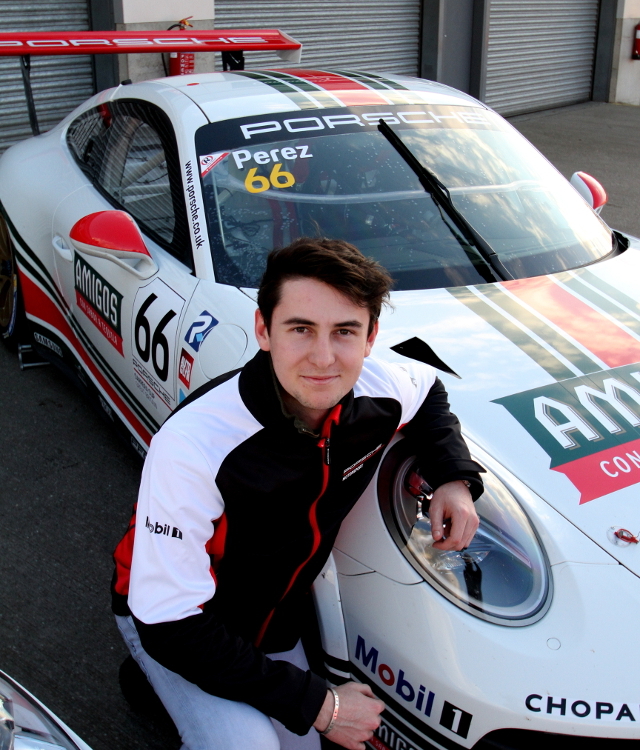 Chesterfield’s up and coming motor racing star Seb Perez makes his way to local race circuit Donington Park this weekend (28-29 April) for the next two rounds of the Porsche Carrera Cup GB Championship. Perez aims to pull out all the stops this weekend after both cars performed exceptionally well just over two weeks ago, that saw both Porsche rookie drivers take on the Brands Hatch Indy Circuit in the first two rounds of the race series. Perez went to the Kent Circuit with a new car never raced before apart from the few test sessions where he had been topping speeds of over 135 mph and taking some top 5 spots. The weekend panned out well for both drivers and their Team Parker Racing outfit at the end, Gamble coming away with a second race win and Perez on it all weekend that saw him knocked back in the season opening race, ending it in the gravel but impressed in race two, making ten places from the back of the grid to take 10th and finish just outside of the ProAm category podium. Free practice saw Seb finishing and maintaining a 7th place throughout the day, Qualifying was a different story, a difficult qualifying session dashed any hopes of a top spot on the grid for the weekends first race. The tight narrow circuit didn’t help as did a track full of cars out for most of the time restricted getting any decent times in and saw Perez take ninth fastest. Weather conditions changed for race one and Perez 9th place on the grid. A wet track awaited to challenge any driver after qualifying set up had been in the dry. Perez knew that a different set up in the wet meant more to learn about the car, as well as racing on wet tyres for the first time. As the lights went out Perez had a good start but tried his hardest for 5 laps fighting like cat and mouse with those in front before moving into 8th place on lap six and taking another place on lap seven to put him in 7th place. Maintaining this position, putting in some great times lap 13 was to be unlucky for Perez, he was shunted from behind that saw him taking an excursion into the gravel where he stayed for the rest of race one. Race two was a different affair, with similar ace conditions and live on ITV4, from the back of the grid but Perez was off the line like lightening. He had made up five places by Graham Hill Bend, by lap 10 he was in tenth place picking off a place every lap. Lap 16 saw the safety car make an appearance that halted any more progress for Perez and finish in 10th place. He added “The car feels great and we are making real progress with every lap. It just feels very comfortable in the Porsche and Amigo Team Parker Racing have done a great job to get the car back out for race two. I really need to continue the pace into the next round at Donington”. 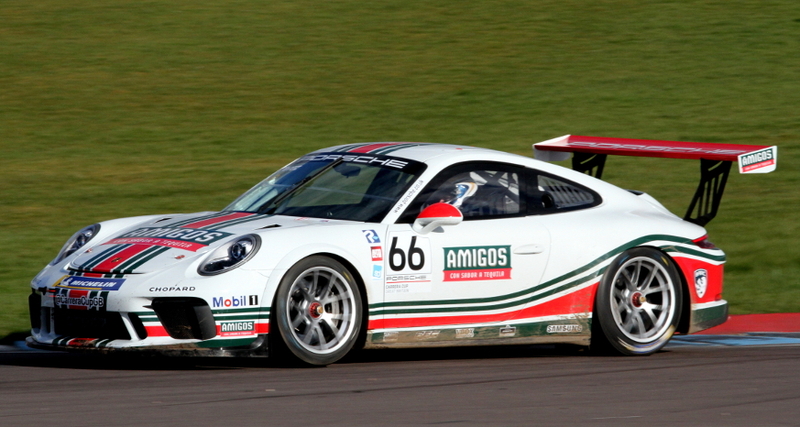 This year’s 16 race Porsche Carrera Cup GB Championship series is one of the most highly regarded championships in Europe and follows the British Touring Car package, with a trip to Monza in Italy for the European Le Mans Series support thrown in for good measure. The next round of the season heads for Donington Park on the 28th/29th April where local support for the Chesterfield racer will be strong, you can follow Seb and the Championship live on ITV4.